First birthdays are always a huge celebration in our family, and keeping with the tradition, I had a ton of fun planning and crafting for our little one's first birthday. I chose a birdie theme, and the colors were coral, peach, a sea foam blue and gold. It was a beautiful day celebration our last beautiful daughter! I chose birdie theme, loosely keeping with her nursery theme. The colors were inspired by a beautiful bracelet set that a dear friend gave me...as soon as she gave them to me, I knew they would be the colors for the party! Creme Beige Striped Paper Straws: Creative Juice Cafe - I then used gold glitter tape and made straw flags. Felt Birthday Crown: Mosey - I received the sweet crown, then proceeded to dismantle and re-create it! It's really difficult to choose a favorite item for the party...I think it was the large photo display. It was so much fun to have a year at a glance, and see our baby grow up. I think the guests enjoyed seeing photos of themselves as well. That birdie cake is the cutest! 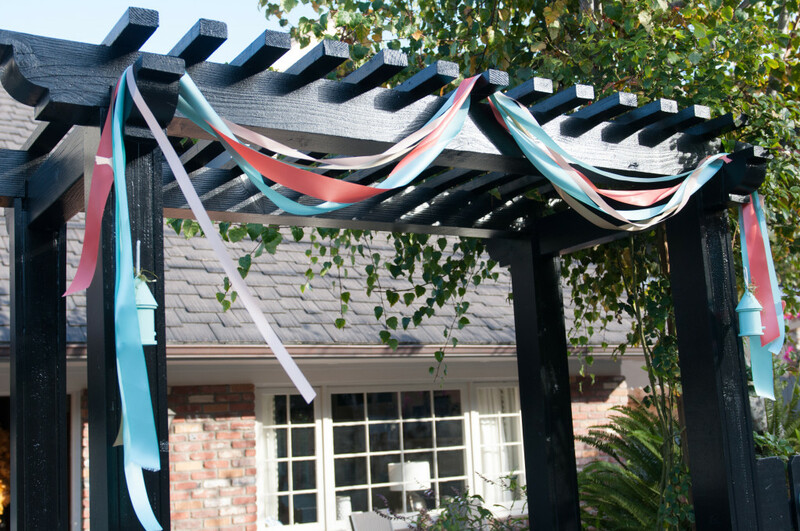 i’d really love t know where the ribbons were purchased as well as the paint colors for the bird houses if possible? Beautiful! Would you be interested in selling the template for the gorgeous invitation you designed?! Where did you get the bird cake topper? I can’t find anything for our birdie birthday! Hi, would you mind telling me the dimensions of the chalkboard? i wanted to order one but they are closed by now… so i’m thinking working out on a real chalkboard by myself! thanks a lot! where did you find the little paper (or felt?) bird cut-outs that you hung from the ceiling? and where did you find the peach colored crepe paper? I love this! I am looking to do a photo display like this one at my graduation party but all of the supplies I’m finding are very expensive. How’d you make yours and where’d you get the supplies? (poles specifically) Thank you so much. I love your invites, is there any template that you can share? I'm a mama to two beautiful girlies, almost three! We're so excited about our new addition and had so much fun putting her nursery together!